What Server should I start on? 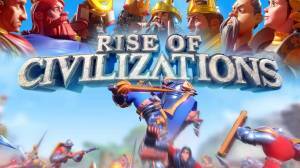 Rise of Civilizations is a strategy game that takes you on a journey through time as it pairs lessons in history with battle engagements that require you to use your strategizing skills to build up armies and special forces specific to your region, space and time. You have two sets of civilizations to choose from, each with their own set of challenges. In the East the civilizations are India, Korea, Japan and China. While in the West, there is Islamic, Britain, Rome and Egypt. Each era and region also features important historical figures that were great leaders such as Caesar, Marc Antony, Ashoka, and Empress Lu. As you move through the different eras of time exploring faraway places building up armies to rule the world you get the opportunity to delve deep into the scheming minds of long ago. What makes Rise of Civilizations so interesting and sets it apart from other warfare and strategic force building games is that the the creators have done their homework and have put in elements of historical nature to stay on point with what really happened during the different periods of time in the various regions of the world. What Nation should I choose? What are the Nation Bonuses? What Troops should I Train? How do you get more than one Commander? What Buildings should I level up? How do I get Free Gems?